I’ve battled some serious anxiety in my life. I was diagnosed with extreme anxiety at one point. I suffered from shaky hands, heavy chest, shortness of breath, blisters on my palms, itchy skin and numbness. I know anxiety. The people around me could vouch that I behaved like I was crazy and it scared them. I also know you can fight back. You should follow your doctor’s orders, I’m not saying anything against meds I know they help many people, but they don’t necessarily fix the entire problem. Sometimes we are feeling things because we need to change, and I know that is what happened to me. Anxiety management meds didn’t help me, it took change in my life to tame my anxiety. I had to learn to let things go. I had to learn to trust Jesus especially when the road was hard. It’s easy to trust Jesus when life is easy. It’s not when you aren’t sure how you are going to feed your children or keep the power on or if you can keep your children safe. It’s not easy when your heart is broken and you feel abandoned and lost. I had to learn to keep close to the sacraments. The sacraments are life giving. The living Jesus is in the sacraments. It’s a gift for us. They are free of charge and available all the time. This mostly meant letting go of my pride; I had to let go of the idea that I should be better than I am. Interestingly enough I also learned that some of the things I felt so much guilt over weren’t worthy of my guilt. I had to hand my broken self over in honesty and humility. I had to realize the world and everything in it wasn’t in my control and much of it wasn’t my concern. I had to realign my focus. My focus was on the fear, but my focus should have been on faith. It’s a lie that we have to get ourselves together before we go to Jesus. It’s a lie that we have to put on a pretty face and hide in a painful silence. It’s a lie that we have to maintain a façade of a perfect life that isn’t real. It’s a lie that we should be able to take every hard turn in life and never fall apart. It’s a lie that we shouldn’t have feelings. You can’t walk the path of fear and the path of faith at the same time. You have to pick one. The path of faith is the road of humility and love. It’s dying to ourselves and letting Jesus guide us. If we are clinging to sin we have to let it go. The good news is that Jesus is very patient. He knows our weakness and doesn’t expect anything else. He wants our weakness. I myself have been intertwined in sin that just fell off of me when I accepted grace. Because we have free will we are free to cling to things that bring death. Jesus will help us if we let go, but he won’t force us to let go. Some of the most powerful moments of my life were moments that I literally threw my hands in the air and yelled out loud for Him to take it. Take the pain and the worry because it was too heavy for me to handle. It was the surrender of my heart that He was after. Surrender brings grace. Trust brings grace. And grace makes everything better. Praying the rosary regularly was a major game changer for me. I know at first it seems monotonous and boring, but when you get past the original adjustment it opens a wonderful world of meditation. It’s a place of safety to open our hearts to our Mother and Jesus. Those mysteries are really ways of living life. Often while praying my rosary I will remember things and people I needed to be praying for. I’ve often just offered the mysteries to the Mother’s Intentions. She knows who needs what and when. The worst part about anxiety for me came at bedtime, when everything was quiet. Unfortunately that’s a great time for all the worries of the world to creep around in our minds. When one loses sleep it’s hard for the body to deal with the physiological side effects of anxiety, so the cycle worsens when we aren’t rested. I found that praying my rosary at bedtime really helped me to fall asleep calmly and quickly. 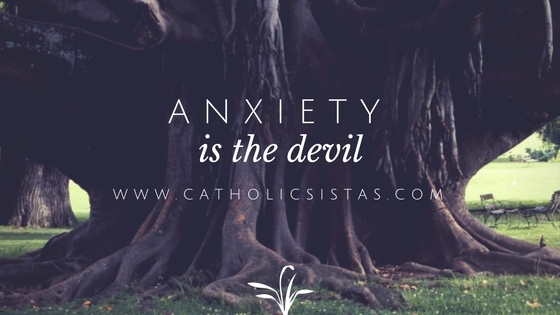 I strongly encourage anyone dealing with anxiety to seek Jesus. I encourage you to put on a miraculous medal and ask our Mother to pray. Our Mother brings grace. It’s a good idea to get as many people in your corner as possible. Be that a priest, a sister, a counselor, family and friends. Anxiety can be very isolating. It’s important to reach out. I’m not a doctor or a therapist; I’m just a simple small town mom that doesn’t have anxiety attacks anymore, and I thank Jesus for walking with me. He set me free from so much pain. I just had to reach out to Him. You can reach out to Him too. He loves you so much and doesn’t want you to feel pain. If you are hurting, He’s waiting for you to reach out for him, too. I urge you to trust Him, and take His healing hand. Grace be with you. Aleigh P. - As someone who has suffered from lifelong (diagnosed) anxiety disorder with OCD and agoraphobia and been in and out of counseling and different medications, I agree with sticking to the medications. I also agree with turning to Jesus and your faith. However one thing I want to caution on: please if you have someone in your life suffering from anxiety do not go the extreme of saying it’s because they aren’t praying enough, they don’t have enough faith, they don’t trust enough etc etc. First of all with anxiety disorder a lot of the times OCD (and also agoraphobia) goes hand in hand. And it is not necessarily washing your hands OCD most of the time this is repetitive thinking OCD and you OVERTHINK things and blow things out of proportion. Second of all this is a chemical imbalance so yes people will need medications to take to balance things out. Yes meds might make you drowsy but you actually might need rest because of way anxiety disorder works. Do not tell people not to take meds. When I was in the worst of my anxiety, bedtime and waking time were the toughest! I was so afraid that God had terrible plans for my life and walked around in fear. Back then, I wish I had sought the sacraments more. Only in the last year did I experience Adoration for the first time! Wow! Jesus really does bring comfort. I thought it was just a cliche from people who didn’t understand the real struggles of life. When I met people who were seriously ill, but still felt blessed to know and love God, it stopped me in my tracks! One thing I like to repeat to myself when I can’t sleep is “Be still and know that I am with you.” Or I imagine Our Lady rocking me to sleep. Thank you for sharing your journey! I know it will give comfort to others going through the same thing.